Well, by now, you have all probably seen this toy or some other Power Core Combiner in stores and formed some kind of opinion on it. Lord knows I have. What I think about the concept is irrelevant to the quality of the toy. But that's the question, isn't it? How good is this toy? Thanks to the generosity of Hasbro PR, we have the means to find out. First, let's look at the individual drones in their vehicle mode. The jeep and the halftrack are by far my favorites. The jeep even has a point of articulation, in that the missiles on top can turn 360 degrees. Both of these toys are very solid, and look nice standing (parked?) next to Bombshock. However, the tank and missile carrier are another matter. The hand so obviously hanging off the tank is incredibly floppy, and the whole of the missile carrier is like a Slinky. However, that weakness can be used to turn the missile carrier into a turret for Bombshock to use. Simply take the blue peg on Bombshock's arm, rotate it out so it's pointing the same direction as the fist. Plug in the missile carrier, set the hand part on the ground, and you're done. Not bad as fanmodes go. So, the drones themselves are actually pretty neat on their own. I could see myself shelling out money to get a 4-pack of drones by themselves to go with the 2-pack PCC figures. Based on this vehicle mode alone, I'm going to call Bombshock Not-Onslaught from now on. This is so obviously an Onslaught homage that I can't believe Bombshock wasn't just called Onslaught. His alt mode is basically a mini version of Onslaught's. And it's not very good. It seems more like an afterthought. The gist of his transformation is basically lay him down, and fold his arms back. It's not a bad alt mode though. It just seems like it would've fit in better with the alt-modes of Armada or Energon. A few years too late, Not-Onslaught. Now, my feelings on the overall execution of Power Core Combiners aside, I really do love the individual scout molds, and Not-Onslaught here is no exception. They've all got nicely proportioned robot modes and nice articulation, which is why I'd actually recommend him for purchase when he's repainted. Continuing the trend of homaging G1 Onslaught in every mode, he also sports two cannons on his back that can be positioned over his shoulder due to the fact that he doesn't have conventional weapons. The only problem that I can find with this mode is that due to his nap-like transformation, he has weak feet. His heels are practically non-existent. Therefore, he tends to be a little top-heavy. This is still a minor quibble, and it's still a nice robot mode overall. And now, on to the entire point of Power Core Combiners. Getting Not-Onslaught into his torso mode isn't that hard, really. Just rotate the backpack 180 degrees, pull it up over his shoulders, and that's pretty much the gist of it. Then just plug in the appropriate drones, and you're done. Let me get the good part out of the way. Not-Bruticus looks really nice as a display piece. The cannons also function in this mode. From his waist down, Not-Bruticus also has very nice articulation. It's about on the level of the Energon combiners, except less hampered by kibble. Now, on to the less than pleasing upper half. Even though Not-Bruticus looks nice, in the end, he can't do much, which is disappointing. I think Power Core Combiners are a pretty cool idea in concept. So far, it's worked 50% of the time, with the Aerialbots being a pretty soild set. The individual 2-packs are actually really neat, and I'm recommending that's where you spend your money if you're looking for some neat scout and Targetmaster figures. But this review is about Bombshock. And unfortunately, I can't give Bombshock a hearty recommendation, not at $20. If he was at $10~15, then I could recommend it to someone who enjoys gestalts and thinks the concept is pretty cool. If you must have a PCC drone/commander set, I recommend going after the repaints, either the Protectobots or the Destrons. Bombshock's final score can't be any more than a 6 at his current price. It was a good first attempt, and apparently Hasbro's learned from their mistake, which is excellent. 6s are slightly above average. If you're really into what you've seen of these pictures, you'll like the figure. If you haven't been sold yet, you probably won't be. Transformers: War for Cybertron - San Francisco hands-on Preview Event! Wednesday night, Activation, High Moon Studios, and Hasbro put together an awesome hands-on Transformers: War for Cybertron game event in downtown San Francisco! At this Transformers War for Cybertron hands on event, we all got a lot of hands on time with this extremely cool new game! 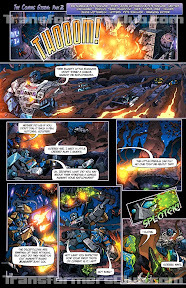 If you haven’t already seen the 3 part coverage from our previous hands on experience of Transformers: War for Cybertron at High Moon Studios and our 19 minute long multimedia photo/video interview with the game designers make sure to check it out. We have already reported on general game play mechanics and single player campaign mode, so for this write up, we will focus on the two new game modes we got to try out! The two new game modes we got hands-on time with on Wednesday were the Co-Op Campaign Mode and the new multiplayer Escalation Mode. Co-Op Campaign Mode was a whole lot of fun especially with the use of the headsets to talk to our fellow players in-game. Assuming at first that one character could be killed off, we left one of our comrades behind while the other two pressed on. This did not bode well for any of us as we then found out that if even one of your fiends dies, you all have to start over. Anyone on your team can revive you back to one brick of life, while Ratchet or someone with the heal ray can heal you up to full life. Thankfully, there are check-points, so when you do die (or a team mate dies), you all get to restart from a relatively near by spot, particularly helpful when nearing the end of a level. Tigatron/Wolfang step aside because there will be no lone hunters in this mode. Looking out for only your self in Co-Op Campaign mode can be down right dangerous; it is important to save the ammo and health scattered throughout the worlds for you teammates who really need it, rather than simply whoever gets there first. We got to play a whole lot more of the story/campaign mode this event, and I was thoroughly impressed! The game play and mechanics, are absolutely fantastic, and the graphics/design work of not just the characters, but the worlds is stellar. Wow, was it a lot of fun. We were able to play an entire level, culminating in a three way team up to defeat non-other than Starscream. This game blows the servos off of the previously released Transformers Movie games and bests it by leaps and bounds. I can tell this game will retain a lot of replay value! It is such a giant heap of fun to play that the only problem is, you just won’t want to set it down. Even if you’ve beaten the Autobot and Decepticon campaign modes, this game has a whole lot to offer! Its non-campaign multiplayer options include team play death match, protect/capture bases, and a new escalation mode. In Escalation mode you don’t get to ‘design your own Transformers’ because this mode allows you to play as all of the iconic characters in their intended color schemes. You and your team mates (more than just 3 of you, but we weren’t told exactly how many more), fight off wave after wave of (non-iconic) enemies, drones, techno bugs, holographic warriors, and even the big thugs. I’m impressed with the level of variation in the “drones” of this game, that is, non-iconic characters. It really doesn’t feel like you keep killing the same guys over and over again, except for the holographic warriors, but you’d expect that (they’re holograms) and they’re a lot of fun to kill anyway. The basic idea of this mode is to see how long you can live, or particularly, how many waves of ever smarter/stronger/faster/more destructive enemies you can ward off before dying. When you kill enemies you pick up chips of energon, which can be used to purchase, health, ammo, new weapons, or new areas of the level in which to fight. This mode was introduced to us as “teamwork or die,” however, in Escalation, only one of your team members needs to be alive to beat a wave of enemies, when a full wave has been beaten, everyone who has previously died comes back to life. One fun touch to this mode (as well as the campaign modes) is that when you ‘die’ you can actually turn and somewhat sloppily shoot surrounding enemies while laying on the ground ‘dead.’ Your team mates have a decent amount of time to come and revive you, but it gets shorter every time you use it. Based on how this mode is designed, it will likely be the most fun cooperative mode to play with a group of mixed skill level players because unlike co-op campaign mode, your team mates can’t hold you back, they can only help you get farther, assuming they’re still alive. 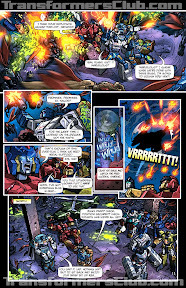 Shortly after releasing the entire issue of last month's Collector's Club Magazine for public viewing, Pete Sinclair from Transformers Collectors' Club Magazine has sent us two preview pages of this year's comic story from next month's Magazine. Check out the pages below!